It has taken me through 3 changes of fabric, and frogging numerous threads, trying to decide whether to stitch with 2 or 1, but the QS Iris and I have finally arrived at a meeting of the minds in at least getting started. With all of the wonderful patterns, so far along, I'm almost embarrassed to post this photo, but I'm trying to remember that everyone has to start somewhere. I always feel this way about starting any of my stitching projects! lol It is just worse with HAED designs because it takes so long for an image to appear. .but well worth the wait! Wishing everyone a beautiful May Day tomorrow! May you receive many May Baskets full of beautiful flowers! I am as addicted to these designs as most of you are. As the matter of fact I think I now have 10 waiting to be started. 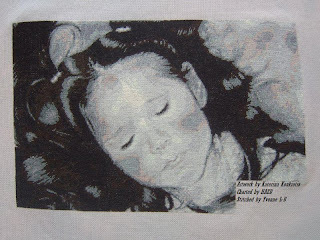 The Final Few is my first one, and my first one on 25 count, but the detail is so dramatic that I don't know if I can ever cross stitch on 14 or 18 count again. I have worked some more on the sky around my panda holding the earth and since it is all still just a little patch of blue, I didn't take a picture. I will for next week, hopefully I will get a lot done. 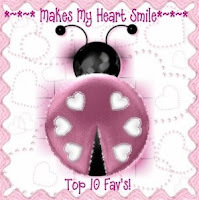 Thanks for reading and Wendy and Cindy thanks for the blog. When I get to the end of my rope I can get on here and read what others are doing and I really enjoy that. You guys give Wendy and I so much pleasure, you can't even imagine!! Watching your starts and seeing all of your progress, thrills us beyond words! We are so proud of every one of you! For May's giveaway, I'd like to change things up a little. I want to give away 50 skeins of DMC regular floss (not the specialty or variegated)....winner's choice of colors! I know some of us don't need or even want more, but some of us could sure use it for future projects. To win, MEMBERS must leave a comment on this post and you must have posted at least ONE progress picture for the month of April. I know life gets in the way, but we're hoping you have been able to stitch and post at least once. I just want to share one feeling I had many times this past week. So I tried to canalize my impatience with this sentence from Lao Tsu who said : "A good traveller has no fixed plans and is not intent on arriving". This still helps me to take advantage of my HAED journey... I think that we must savour every stitch we do... because it's a priceless wonderful adventure. Thank you so much.... ! 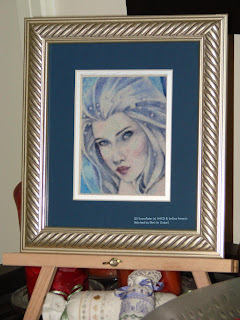 A big Thank You to Annette who posted on the HAED BB on how to add your name to your works. I hope what I've written is correct. If there's any mistakes, please let me know. 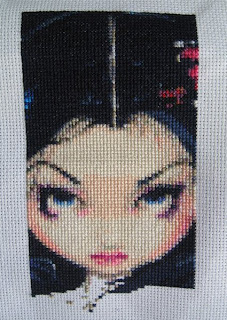 I've spent the last 2 days stitching her and really excited to see that her hair growing :0)) Have a great day, everyone and looking forward to see your WIPs. Yesterday evening I finished the page. 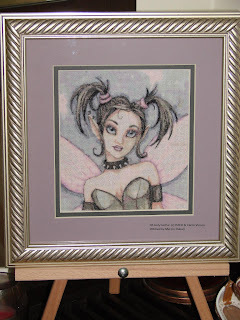 5000 stitches were needed this week to do so. I love all the updates from everybody. I am looking foward to the drawing of 1 may. !!!!!! We really love our community here and we can't even tell how much we enjoy all the friendships here. Are you all ready for our next Thursday SAL ? We're looking forward to see all the lovely progresses. We also would like to tell that Friday we pick a winner for the giveaway of Cindy!!! So watch our blog on Friday!! 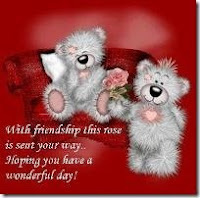 Wishing you all a wonderful weekend and lots of stitching fun. Stitched 1 x 1 full cross on Lavender Bliss 25 count Lugana with DMC floss and Petite Treasure Braid PB10 for the sparkles. Stitched 1 x 1 full cross on 25 count hand-dyed evenweave with DMC floss and DMC metallic (the one on the skein) for the sparkles. Hope everyone has a great stitching week! I love seeing all of your progress pics, they are all fantastic! This is my first post, sweet!! I wish I had more to show you! So far I've just picked the HAED design I want to do. 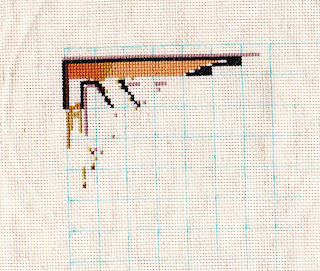 Since I've only every done kit cross stitches I thought I'd ease my way into things by trying something relatively small...so a Peekaboo it is!! I just loooove Jasmine-Beckett designs and am now tossing up between Pale Rose, Sea Beacon and I Will Hear No Evil. (Don't worry, the joys of owning a store mean I will have them all available!) But kitting them out will be a new experience. 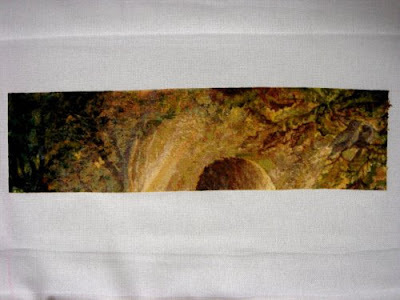 I've only stitched on aida before and really want to try evenweave or linen. This is all very exciting and I'm thankful that you guys are letting me participate!! Thanks so much!! I know I'm MIA these days, but I'm getting divorced and selling my home so I've been a bit pre-occupied. lol It's all a good thing, but stressful just the same. I've not picked up a needle in about a month now and I'm missing my HAED pieces really badly. I even got a new chart for my bday and a GC for HAED site as well. I got Desire by Rachel Marks and the GC will be spent on Eros by Marks as well. I LOVE those pieces!! So, I'm still here just temporarily gone for probably another month I'm thinking. When I get a chance to I come and post and will continue to do that. 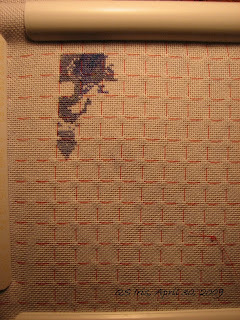 I didn't post last week (time just got away from me), so this is 2 Thursday's worth of stitching on Storykeeper. I'll definitely be joining in this thursday, and will probably stitch on her through the weekend. Finally, I have reached the last week of college and my time will be free to stitch, stitch, and stitch! I love watching everyone's progress and think that everyone is doing fantastic! This blog is definitely motivating me to get my behind in gear! “Ears” what I have done this week! I am enjoying stitching this so much that it’s all I have worked on having recently finished a project and abandoned another until I get a different fabric. 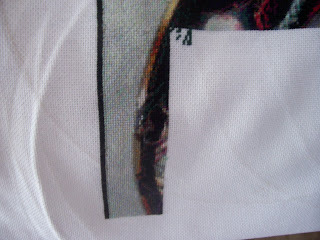 I have done over 3000 stitches and have only a few hundred more before I finish the first page. I am missing one colour thread which I have ordered today so hopefully this will come tomorrow. 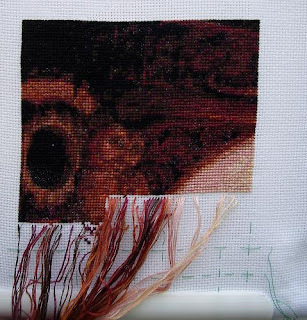 Once I had started stitching the “ear” I just had to carry on with it – you know how it goes…just one more block …then a new colour…I’ll just fill in this gap ! Next week I hope to show the first page completed and also some progress on HAED Cats. I enjoy reading your comments they are very encouraging so thank you. I joined some time back but life was a little busy. Things are slowly getting back to normal so I'm hoping to get back into my HAED stitching! A brief little intro - my name is Mel (short for Melissa), I'm an Australian living the expat life in Dubai, United Arab Emirates. I'm married to a wonderful man and we have two great kids (boy, almost 14, and girl, 11). We also have a rather pampered dog called Tikki. I went through a bad case of startitis so have many WIPs but gradually managed to curb that urge enough to actually finish two - QS Snowflake and QS Girly Gothic. 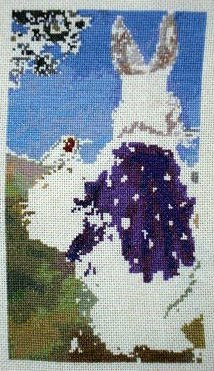 At the moment I will be concentrating on my QS Plum Gothic (Vinson) WIP as she is the closest to being finished. This is my current progress. 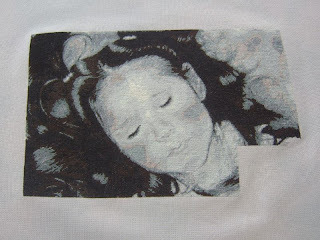 I am stitching her on 27 count white Linda evenweave with DMC floss. There are no sparkles in this one. Hi ya'll. It seems like it's been forever since I've posted. We've been having such great weather in South Louisiana, it's hard to find time to do any stitching when there are so many activities and festivals to attend!!!! Hello all. What fantastic work everybody is displaying. I hope you are all enjoying stitching yours as much as I am mine. Here is an update of enchanted flute. I don't feel like I'm making much progress due to all the confetti stitching but posting updates on here makes me realise it is coming on. Confetti stitches are something I'm going to have to get used to as the whole chart is made up of them. Just as well I'm enjoying it. Wow, everyone is making such great progress! I don't think I ever gave the details! She's on 18ct white Aida, 2 over one full x's. Just a reminder its stitched on 22 count evenweave with 3 threads in tent stitch. I'll try and take an update of my other projects. Also I'd like some advise...I've recently started Motherhood in colour, on 18 count in 1 strand full crosses...I'm considering to do the actual mermaid in 2 strands and keep the background as 1. Do you think this would work? I just wanted to let you know that I finally cleaned out my mum's apartment and now only have to fit all the things I want to keep in my apartment (which of course does not have rubber walls *sigh*). Please bear with me for another two weeks and things should be back to normal. I started stitching on some smaller projects again, because right now I simply do not have the necessary space for my HAED project. I really enjoy all the projects I see on this blog and they get me so itchy to finally get started on my design. 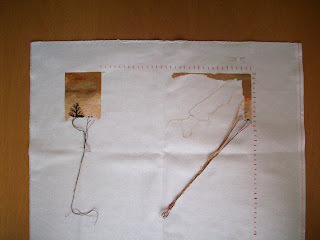 I wish you all a great week and happy stitching. Those clouds are looking better and better! I started this for my husband and haven't let him know I'm doing it yet. He can't keep track of my millions of starts anyway. This is TT Sampler C done on lt oatmeal fidler cloth in 18ct. Whenever you post, would you please label your name and pattern name....don't need designer names....list already very long:) You may want to scan through the labels (below the member's list on right) to see how we've already got you set up. If you'd rather be under another label name, feel free to go to posting and edit to change:) We really appreciate your help! I'm in the process of cleaning up! So if you've never posted, expect an email soon:) We'd hate to lose you, but Wendy and I need to know if you've joined to post or just look. We have a list of people wanting to join and I know we don't have 100 members posting progress pics....some have never posted at all. Thanks for your help and have a great week! My husband and I just bought a new house girls! When our real estate agent called us at twelve to tell us that our offer was accepted, my husband jumped and shout out loud..... For my part, I started to cry loooooool What a scene, you can imagine... I'm shaking right now!! Well, I have been a very busy stitcher for the past week. 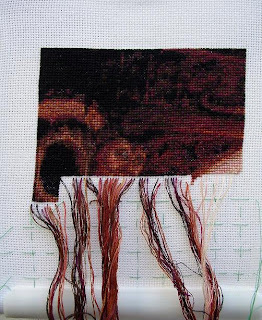 Last Saturday, I started to stitch page 9 of Wizard's Emissary and finished the page yesterday. It took only 8 days to do the entire page. Here is a picture of the project so far and a closeup of the page I just finished doing. I am really loving the details in this project and can hardly put it down to do other things. I am ready to start on page 10. If I can keep up this pace, I should have the next row of pages done in a couple of months, but I know that won't happen. I find that after a while, I need to put the project down and work on something different for a few days. Out of all the HAED charts that I have started, I think this is my favourite one. I keep coming back to it fairly often. I just enjoyed watching all of your wonderful progresses. This is such a wonderful community here and I enjoy all of your wonderful friendship. Keep up the good work. 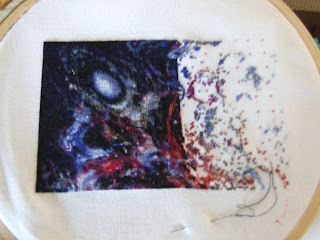 I have been stitching all week on my HAED, I mostly stitch every evening. I did forget all about my other WIP's last week. 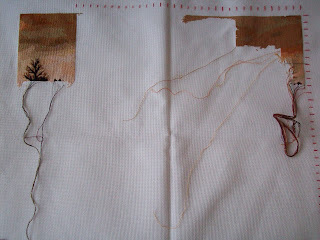 Today is a rainy day here, so I'm planning to enjoy a relaxing day and do a lot of stitching on my HAED. Wishing you all a wonderful Sunday and a lovely week. WooHoo!! 1 down, 27 to go:) Sorry, no before pic. We moved everything from my old computer to my new one (my dh's old computer) and I couldn't find my pic from last week. But it's on my other blog:) I stitched everything from the tip top of the owl's head from left end to right end...1400 stitches with 51 color changes!! Thank you everyone for the wonderful comments on my last post, I just love getting comments. 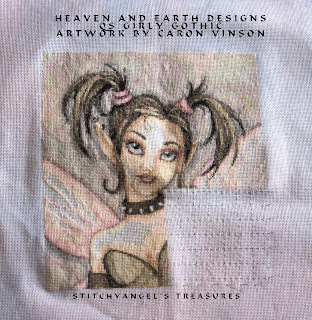 For the Thursday night SAL I decided to stitch on Gypsy Rose, I don't have a before shot but here is where I finished up with her. 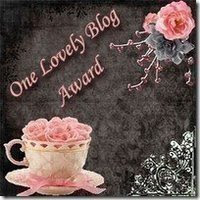 I also had a new start and I am having a competition on my blog, Aussie Stitcher, so pop on over and try your luck!! 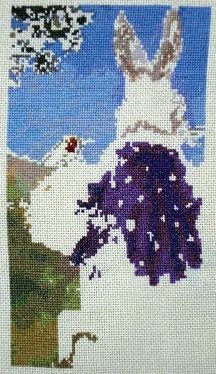 this is my progress of my snow white, it is not fast forward but I enjoy it very much , it's so nice to see it grow. I make no more than 800 stitches a week because of the many confettie stitches but that is okay as it goes forward, I am satisfied ... and each stitch counts, right? I didn't get near as much time on this as I thought I would this week. I had unexpected company drop in & I didn't stitch like I would have! That's ok thou!! I am making pretty good progress on it, considering how many WIP pieces I have! Ok. .I know. .it's not the greatest habit to have, but it is better than eating a whole bag of Cheetos or Oreo's. . I haven't posted in a while but I wanted to show you the progress of my tree. Yes, I am still stitching on this blasted tree!!!! I can see the light at the end of the tunnel so to speak. It is almost finished!!!! I do love looking at everyone's projects!!! They are all just so stunning!!! I'm sure that none of you wants to see a photo of my frogging techniques. I had posted a photo of my meager beginnings of my QS Iris, after many mis-starts, on my personal blog, and was going to duplicate it here, after I had completed a little more on it. There just wasn't that much to see! Well, now there is even less. I had been debating as to whether to stitch with the two threads, as indicated in the pattern, or a single (I'm using a 20 count). 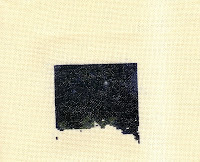 I even did a sample stitching on the corner, and couldn't decide. .one is too lumpy looking, while the other shows the fabric. .what to do, what to do. 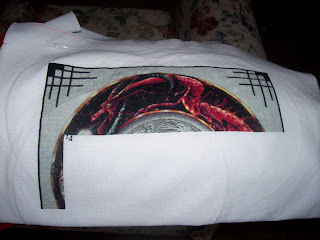 .well, after getting two completed blocks done, I looked at it this morning, in strong natural light, without any sight aides, REALLY up close and personal, since I am so nearsighted, and with the two threads, it is just totally unacceptable. I'm going to have to live with some fabric peeking through, I guess. Every day, I see all of your wonderful patterns coming to life, and I can't even get past the first couple of blocks. .I feel so discouraged right now. .but hopefully, once Mr. Froggie gets through with his tea and crumpets and moves on, I'll feel better. .at least I'll feel like I'm starting anew. .again. Not so much progress this week. Certainly not nearly as much as I had wanted to make. 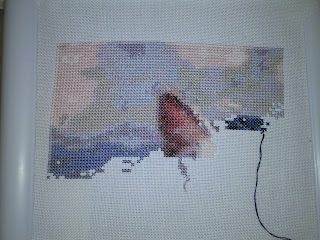 I still have a little bit of stitching left before I finish page 4. I'm happy with my progress, considering some other huge WIP's I'm working on took quite some time these last weeks. See you all next week, and take care! First of all I'd like to apologise for my lack of update pics. I seem to be in a blogging slump right now and haven't updated my own for over 2 weeks. I have however been following this blog and find myself checking 2 or 3 times a day for update pics. You are all an inspiration and I LOVE seeing all the pics. I have been stitching thankfully. I have some pif's and gifts to stitch at the moment so I'm stitching on them quite a bit, but I have been working on Cabin In The Woods and am getting very close to finishing my 5th page! I will be 22% done with it once this page is done lol, so still a fair way to go. I'll post another pic of the whole design so far as soon as I've finished the page. I'm not sure what to do when I do finish the page, start another page on Cabin, or do some on one of my other HAED's, Alisha QS, Always Dreaming QS or Romeo & Juliet. What do you think I should do? 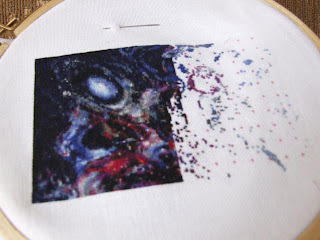 I thought I could have much time to stitch when my son passed his entrance exam.But I was feeling restless because I was worried whether my son would be able to adjust to his new school, so I hadn't more stitches done. I know I'm a indulgent mother.LOL!! Now, his entrance ceremony is over and he has found his feet way.So, it seems I'm able to have much time to stitch from now. Here is the latest WIP picture of my Forrest Friends. I have finished page 5, and 1 more page to go to finish the first row of pages. Here's my progress for the last couple of weeks as I did not post last week. I have now finished page 2 so only one more page or 64 rows ( I think) to go and she'll be finished! You ladies have truly been an inspiration!